I've been gone for a little while but when I returned I finally got out my fall deco stuff and started putting together the kitchen-dining area. 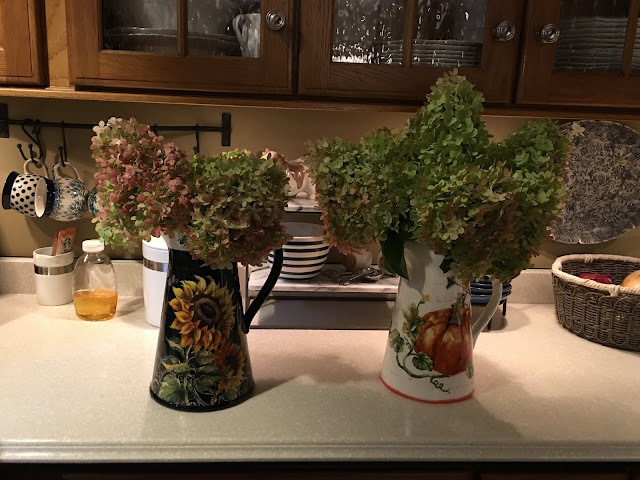 Before I went away I cut some Limelight Hydrangeas and put them in these pitchers with water. Eventually (5 days roughly) they stop drinking and the soft petals become papery. When I got home they were dried out enough and I just tossed out the water and then arranged them in my container. I remembered seeing these olive buckets at Michael's so I grabbed one (50% off $6.99) and put some chicken wire down inside to help the hydrangeas stay in place. I'm actually going to set this down on the left near the rooster but for now it's center stage! On the plate rack wall I added some old and new pieces for fall and even a step towards Halloween. The Water Color Black Plaid dishes are new from Pier 1. I bought them a little while back and figured they will make a nice backdrop for accent plates. I've had the Harvest Pumpkin Watercolor dishes from Pottery Barn for a few years and I believe they still sell them. The maple leaf plates are from a set of 4 that I've had a while and the coffee mugs were also from Pottery Barn a couple of years back but again I think they still sell them. A venture through Kohl's one afternoon landed me with this black and white checked runner. This could also be hung on a door. The étagère got emptied, dusted and decked out for fall too. I changed the wall plates to the roosters to add more black and white. The Farmer's Market tin is also from Michael's as well as the Happy Fall piece and the floral cluster from last year also came from there. The pumpkin came along a couple of years ago and is a Polish Pottery piece. I can put a candle inside to light it up when I'm ready. I set it on a inverted bowl for height and put a wreath at the base. I had the metal pumpkin and found the satin nickel painted basket in my stockpile and thought it would be a good pickup to the pumpkin. I stuffed some faux berries and pumpkins inside. I decided the copper wine bottle coaster needed something so I placed a little glass pumpkin on it. So I've begun embracing fall starting here in the kitchen dining area! Sorry I haven't visited many of your blogs lately but I'll get back in the swing of things now! Oh I love it all. So pretty. Your table center piece is especially beautiful. Thank you Marty. I’m pleased with the hydrangeas and glad to bring some of my garden indoors! You have some super cute decor for fall Liz. I love the black and white checks with your decor. So pretty. I did not know you could dry hydrangea's the way you explained. I have always hung mine upside down to dry out. So messy and hard to do. So thanks for the tip on how you do this. Happy Sunday. Thanks Kris! The black and white really added a nice pop! Liz, your kitchen and dining area looks so nice! I just love the black touches and rich colors of fall in your home. Thank you Stacey! I do enjoy the fall colors especially since we are blessed to witness these colors when the trees change. Your kitchen and dining area looks so festive and pretty for fall. So you know my kitchen is decorated in black and white checks and that there is a 💯 chance of me borrowing from this great autumn look you’ve created!!! You and I think SO MUCH alike!!!! I started my autumn decorating over the weekend. We will have interchangeable decor!!! GREAT job, as always! Glad you liked it Alycia! I do love the black and white combo too! We would be dangerous together if we lived close by!! Liz, your black and white theme feels really fresh for fall. The orange accents are perfect. I LOVE the hand-woven corn! I buy all sorts of artisan-crafted pieces. Thank you Sandra. Aren’t those woven corn pieces neat! Very pretty fall decor Liz. The black and white is striking. I love your hydrangeas. A beautiful collection of fall accessories welcome fall into your home. Oh Liz, this all looks so pretty! I always love seeing your plate rack styled for the season, and the black plaid plates are perfect paired with your pumpkins! I think the way you have used fall and Halloween together is so much fun and very successful! Fall fabulous! You have made me want to dust and play with dishes! I love all your seasonal decorations Liz! I'm especially partial how you decorated your plate rack. Thank you Pam- I love to change the plate rack up seasonally. Liz, it all looks wonderful! I love how you've styled your plate rack. I recently picked up 3 black and white saucers at a thrift, thinking the same thing. Right now I have them stacked under a black bowl. Thanks Jann- black and white is so versatile! Oh Liz, you are certainly autumn ready in your kitchen! 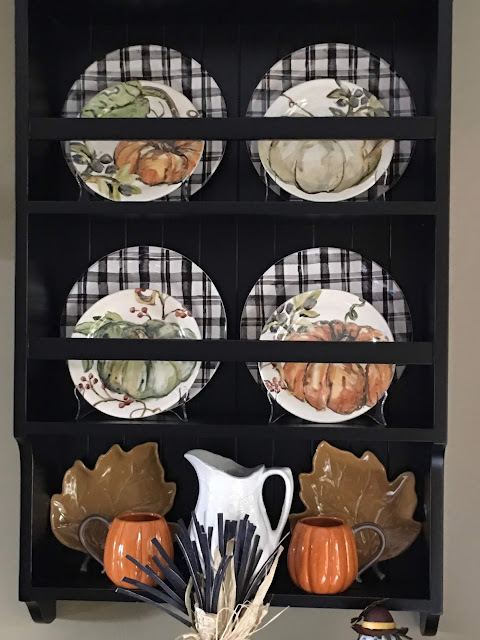 I love the plate rack with the black and white plates with the pumpkin ones in front, they really pop. Your centerpiece of dried hydrangeas is lovely. I am really behind this year, with 90+ degree temperatures, it is hard to get in the fall spirit! Liz, you kitchen adorned for fall is beautiful! You have such a pretty collection of fall decorations and the Halloween pieces are adorable, too. The dried hydrangeas add the perfect finishing touch! Enjoy your week!!! Hosta Shuffling, Turkeys and Limelights!